The Captools/net Server Control Panel, Backup Options provide an option to copy Captools/net data backup files to network drives which are external to the computer hosting the Captools/net. These can be "cloud hosted" virtual machines accessed through a virtual private network (VPN). 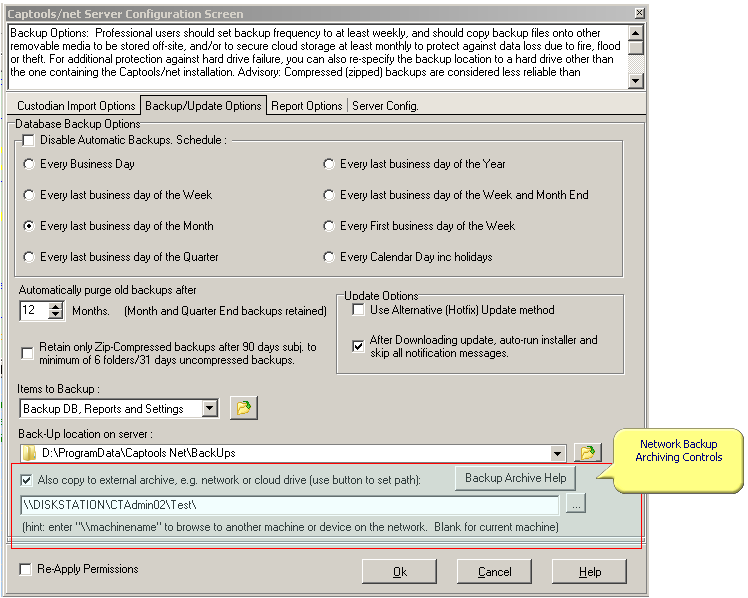 When correctly set, whenever a backup is generated, a zip-compressed copy of the Captools/net backup folder will be copied to the network drive and folder specified in the text box above. The button to the right of the text box should be used to navigate to the desired folder, starting from the root path already displayed. A UNC Path (i.e. full path to destination starting with \\network machine name) is preferred to using a mapped drive. To change the root enter the dialog and blank the contents and click on the button on the right to drill down to the desired path. Any desired destination folders should be created on the destination machine beforehand, i.e. Captools/net will not create new folders that you might specify in the path. CTTasker Log On Credentials - Because the Captools/net backup process can be scheduled, it is executed by the CTTasker Service, which in the default configuration runs as a "Local Service" on the hosting computer. As such while it can read shared drives and folders on other network computers, the CTTasker will typically not have permissions to write data to those resources unless it provides User Id and Password credentials. Therefore you will need to also assign "Log On" credentials for the CTTasker as described at topic CTTasker Service.